El Niño and La Niña are officially defined as sustained sea surface temperature anomalies of magnitude greater than 0.5°C across the central tropical Pacific Ocean. 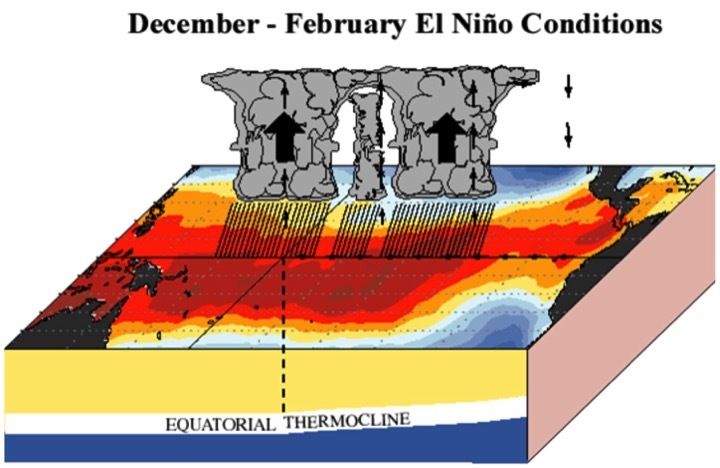 When the condition is met for a period of less than five months, it is classified as El Niño or La Niña conditions; if the anomaly persists for five months or longer, it is classified as an El Niño or La Niña episode. Historically, it has occurred at irregular intervals of 2-7 years and has usually lasted one or two years.These periods often coincide with the transition between El Niño and La Niña events. During ENSO-neutral periods the ocean temperatures, tropical rainfall patterns, and atmospheric winds over the equatorial Pacific Ocean are near the long-term average. During El Niño conditions, the usually present east to west winds weaken and an anomalous west to east flow develops. The west to east flow drives warm equatorial waters from the western Pacific towards the eastern Pacific and northern South America. Impacts of El Niño in the eastern equatorial Pacific include an increase in sea level heights, a decrease in cool water upwelling and an increase in sea surface temperature. The increase in sea surface temperature leads to increased convection and an increase in the risk for heavy precipitation in northwestern South America. During La Nina conditions, the east to west flow present during neutral conditions is intensified. This anomalous wind regime is responsible for anomalies in sea surface temperature; above average in the western Pacific and below average in the eastern Pacific. In accordance with the shifts in sea surface temperature, rainfall will be relatively higher in the western Pacific and relatively lower in the eastern Pacific. 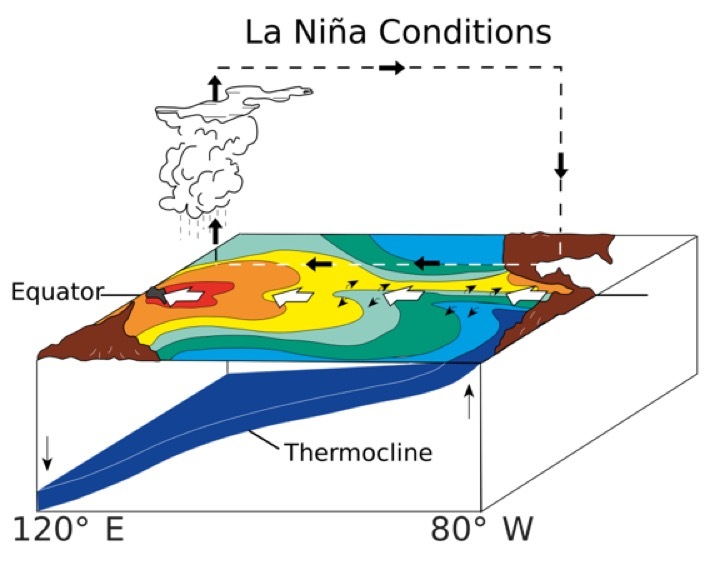 During La Nina, the deviations of sea surface temperature and rainfall from normal are generally less dramatic than the deviations that occur during El Nino. Lower Atmospheric Circulation: Enhanced east to west flow– Surface air pressure is anomalously high over the central equatorial Pacific, for example Tahiti, and anomalously low in the western equatorial Pacific, for example Australia. This increased gradient in surface air pressure drives a stronger than average flow of surface air moving from higher pressure to lower pressure, or east to west across the equatorial Pacific Ocean. Surface Water Circulation: Enhanced east to west flow– The lower atmospheric circulation has a direct effect on the surface water beneath it. Along the equatorial Pacific Ocean, the east to west movement of air in the lower atmosphere along the equatorial Pacific Ocean works on the water below it. During La Niña conditions, this means an enhanced net surface water transport from east to west resulting in cooler than average surface water temperatures in the central and western Pacific. Upper Atmospheric Circulation: Enhanced Eastward flow– Low level winds converge over the warm waters of the western Pacific and rise. The forced ascent of the very moist air creates heavy rainfall in the region, wringing the air of moisture. The now dry air diverges out of the top of the convective region, moving out over the eastern Pacific to sink over the cooler than average waters. 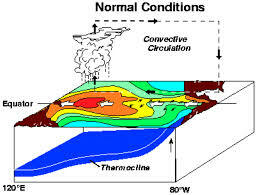 Thermocline: Increase in slope, slanted down from the eastern Pacific to the western Pacific– The thermocline marks the transition between the warm upper water and the cold deep water in the Pacific Ocean. The increase in slope enhances upwelling of cooler, nutrient rich deep water towards the surface layer in the eastern equatorial Pacific. During ENSO neutral conditions, surface trade winds blow westward across the equatorial Pacific Ocean. Blowing against the ocean’s surface, these winds result in a westward current. These persistent winds and currents are responsible for sea levels in the western Pacific, for example, in Indonesia, to be up to 50 cm higher than those in the eastern Pacific, for example, in Peru. Neutral conditions also foster upwelling of cool, nutrient-rich sea water on the northern Pacific coast of South America. This process supports a healthy marine ecosystem and promotes robust aquaculture activities. Compared to other equatorial Pacific regions, the equatorial region from South America to the central Pacific will experience relatively cool sea temperatures contributing to relatively dry conditions in that area. Lower Atmospheric Circulation: Towards the West– Surface air pressure is higher over the central equatorial Pacific, for example Tahiti, than the western equatorial Pacific, for example Australia. This gradient in surface air pressure results in a flow of surface air moving from higher pressure to lower pressure, or west to east. Surface Water Circulation: Towards the West– The lower atmospheric circulation has a direct effect on the surface water beneath it. The east to west movement of air in the lower atmosphere along the equatorial Pacific Ocean works on the water below it, resulting in an east to west current near the surface. Upper Atmospheric Circulation: Towards the East– The low level winds converge over the warm waters of the western Pacific and rise. The forced ascent of the very moist air creates heavy rainfall in the region, wringing the air of moisture. The now dry air diverges out of the top of the convective region, moving out over the eastern Pacific to sink over the cooler waters. Thermocline: Slanted down from the eastern Pacific to the western Pacific– The thermocline marks the transition between the warm upper water and the cold deep water in the Pacific Ocean. Under neutral conditions, the thermocline is slanted down from east to west across the equatorial Pacific Ocean. This allows for upwelling of cooler, nutrient rich deep water towards the surface layer in the eastern equatorial Pacific.